Cost in Hair Transplant procedures vary widely. 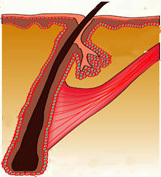 Cost in reputed AHRS centers is calculated on the basis of the number of grafts done. A graft is a collection of hair follicles - hair follicles do not exist singly but are grouped into clusters and these clusters are called follicular units or grafts. Grafts are extracted and planted individually and each graft contains 1,2,3 or even more number of hairs. The grade of baldness of the patient is the prime determinator of the cost to the patient. The higher the grade of baldness, the more the grafts needed by the patient and hence higher the cost. Grade 7 baldness which has lost all hair except the hair at the sides and the back requires 4500 to 5000 grafts including from the beard and chest area, and hence cost is highest for grade 7. Someone who has just had a receding hairline in the temporal region may require only 500 to 1000 grafts and hence cost will be lower. The number of grafts required is also determined by how low the hairline a patient wants – a patient who wants a lower hairline will require more grafts than someone who does not wish for a low hairline. How many grafts a person wants to do also determines his or her final expense, and this in turn depends on the budget that the person has determined for his or her transplant. Depending on the patient's wish, a patient may have a lower or higher budget and can accordingly determine how much grafts he or she wants to do. Some patients are satisfied with only a light cover and may choose to do less number of grafts while some want a full head of hair and are ready to spend a large amount for this. Thus a patient can choose how much grafts to do. A patient may be told he requires 2000 grafts to cover his baldness with high density, but he may opt to go for only 1000 grafts with lower density coverage. Alternatively he may do only the front portion, or he may choose to do 1000 grafts now and another 1000 grafts after 6 months, all depending on his budget and his desire. Hair transplant is after all a cosmetic procedure and every person's needs and desires are different and accordingly each person may choose to go for higher or lower number of grafts. Price per graft is the third important determinator of the cost. Price per graft varies due to a number of factors. One of the main determining factors of the price per graft is the type of procedure performed. FUE is more expensive than the strip method, as it is has more advantages and only few surgeons can offer this. FUE also takes up much more of the surgeon's time than the Strip method. Costs also vary according to the region - typically costs will be more in larger cities than smaller ones. Individual variations in different clinics are also there - those with a larger infrastructure will typically charge more than small, single doctor units, which have fewer overheads (though the safety, sterility, etc may also be compromised in such units). Recently, a lot of controversy has arose about unsafe, small illegal units which offer hair transplant at a discounted price as procedures done in such clinics pose a lot of risk to the patient. Main determinant of price per graft is the doctor who performs the surgery. Small commercial centers get the procedure done by technicians, ayurvedic or homeopathic graduates or at best by MBBS graduates. That is why they can offer the procedure at cheaper rates to attract patients and also offer various discounts, etc which should not have happened for a medical procedure. But because of lax regulations, this is allowed in India. Patients who are offered such rates by such centers should enquire about the qualifications of the doctor who is performing the surgery. Such centers also sometimes get the procedure done by a roving doctor or technician team who come only for the procedure and then go back, leaving the patient without any followup for discussing problems. Ideally, only AHRS registered or certified doctors should perform this procedure. AHRS (Association of Hair Restoration Surgeons) is the official body of hair transplant surgeons in India, membership or certification from this body is possible only after meeting strict regulations and qualifications. Dr. P. J. Mazumdar is a registered member of AHRS and a memeber of the Ethics Committee of the AHRS and meets all rules and regulations that are prescribed by this and other international bodies. He is also a Diplomate of the American Board of Hair Restoration Surgery and all ethical and technical norms of the ABHRS and ISHRS are followed in the clinic. Cost of hair transplant in India varies between ₹40 to ₹100 per hair in AHRS registered centers which are the gold standard for hair transplant. As discussed above, the costs vary according to whether it is FUE, the size of the center, etc. In Kolkatta and New Delhi, the cost for FUE transplant in an AHRS clinic varies between ₹50 to ₹70 per graft for FUE. Cost in some luxury clinics can go upto ₹ 100 per graft. Medical costs in metros are higher which are not affordable in a region like the North East. Cost per graft in Arogyam Hair Transplant Clinic is ₹40 per graft. This includes all costs including GST, anesthetic charge, OT charge, etc. and is offered as a package. In addition to this cost, there is a small OT charge of Rs 4000 per procedure. Depending on the number of grafts done, cost can vary from a minimum of Rs 24000 to more than a Lakh. Most people in the North East do about 1000 to 2000 grafts in a session due to various constraints and so the average cost for a transplant is usually between ₹44,000 to ₹84,000. These prices are fixed hospital prices and are the same for everybody. No discounts are given. This figure is the total cost and there are no other hidden costs. The external costs which are not to be paid to the center include: investigations of about ₹1500 which are needed for any operation in Downtown or other hospitals and registration of ₹600. Medicines are not expensive, costing about ₹600 or so. PRP (Platelet Rich Plasma) : One session worth Rs 5000 free. Total : Rs 11000 worth of treatment free with each surgery!! Look up here for a table on the approximate costs according to the number of grafts done. Installment facility is available only for salaried workers of state and central government including defense and security forces. Legal agreement has to be signed with the Hospital for availing installment system. This agreement is binding and the clinic reserves the right to take legal action for any trespass. Patient must reach the hospital on the day prior to the procedure for carrying out the formalities for installment payment. The patient must produce salary slips of the previous two months. In general, monthly salary should be at least three times of the amount to be paid as installment. Patient must also produce bank statement of last three months and have a generally good standing. Photocopy of Identification proof such as Drivers license or Passport and Employment proof such as Identity card of theInstitution has to be given at the time of payment. Instalment payment will not be considered if valid cheques are not available. 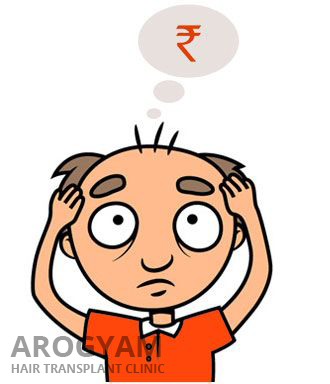 In Arogyam Hair Transplant Clinic, the costs have been kept at the minimum. This has been done despite the procedure being done through FUE and using the full safety and sterility of the hospital OT and its well staffed and fully modern OT theaters. This allows us to offer the full benefits of this procedure in the NE region where it is still relatively unknown. Persons with high grade baldness usually need between 1500 to 3000 grafts while those with lesser degree of baldness with temporal hairline recession can often get a very nice effect with 500 grafts only. One big advantage of the FUE procedure is that it allows the patient to get the procedure done in stages so that the cost burden does not come at the same time. This was not possible in the earlier strip method. A patient who needs 1500 grafts for example to cover his bald areas, can do just 500 grafts in one session, then do another 500 grafts after 3- 6 months or so and a third sitting later, thus spreading the costs. This way he will ultimately get the same benefit on 'installment' basis without being financially stressed. 500 grafts can be used to give a good dense 'forelock' which is very effective in reducing the bald look. Of course, the more grafts that are done, the better is the overall effect. Such spread out sessions of transplantation also have an advantage in that the hair growth is not dramatic and not noticeable. Celebrities and others who are constantly in the limelight often prefer to go for such distributed sessions so that there is no sudden change in appearance which might cause comment. The disadvantage is that all the hassle of a procedure is repeated many times. Hair transplant is a one-time cost. There are no further maintenance costs at all and the hair will last your whole life without needing any care. Hair gives you a young and youthfull appearance and helps not just socially but also in one's career. Read up here for a witty writeup on this hair vs baldand hairy American presidents. Transplants will change not only the way you look and give you greater confidence and ability; what so many research studies have shown is that people tend to place greater trust and belief in those with hair than in balding persons. Sometimes people are offered very low quotes on the phone or after enquiring on the web. It should be remembered that such quotes are always suspect. It is upto the patient to make sure that he is not being taken for a ride by some illegal and unsafe clinic. Clinics will offer anything to get the customer into their grip and it is only then that they will show their true face. having the procedure performed by roving teams of doctors or even technicians who perform the procedure and disappear, so that they cannot be accountable. Offering various discounts and offers to attract patients instead of discussing the transplant itself. Arogyam Hair Transplant Clinic does not want to discuss any low price offered by some center or other. This is among the lowest price offered by reputed AHRS registered clinics in India, though clinics of lesser standard may offer cheaper prices. We do not compete on prices, only on quality. Arogyam Hair Transplant Clinic uses the best instruments like 6X Heine loupes, Titanium Blunt punches, best sterilization and other practises, etc to ensure quality which in the final run is more cost effective than an intial cheap procedure. Contact at the center to further discuss the costs and the final estimate.